The Los Angeles Kings will receive the first ever Make-A-Wish Greater Los Angeles Power of a Wish Award at the 4th Annual Wishing Well Winter Gala on December 7, 2016 at the Hollywood Palladium, it was announced today by Neal Aton, President and CEO of Make-A-Wish Greater Los Angeles. Hockey star and former LA Kings team captain Luc Robitaille will accept the award on their behalf. 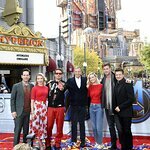 The LA Kings join Academy Award-winner Robert Downey Jr and industry power broker and multimedia entrepreneur Scooter Braun in receiving honors at the Wishing Well Winter Gala, as previously announced. The Power of a Wish Award recognizes an organization for its outstanding dedication to corporate social responsibility and its commitment to caring for the communities in which it lives and serves. Make-A-Wish Greater Los Angeles selected the LA Kings for this honor because of the team’s many years of philanthropy, wish granting and involvement helping to further the Make-A-Wish mission. This season, as part of their “Forever 50” program marking their 50th anniversary, the LA Kings are planning a number of exciting events with Make-A-Wish Greater Los Angeles and the kids they serve. “Make-A-Wish Day with the LA Kings” will be held on Wednesday, October 26th at the Toyota Sports Center. Fifty wish kids from across LA County will attend a Kings practice, tour the facilities, have lunch and skate with the Ice Crew and the Kings’ mascot, Bailey. On Wednesday, November 30, the Kings will host “Make-A-Wish Night” at STAPLES Center for their game against the San Jose Sharks. Discounted pricing is available, and a portion of the proceeds will benefit Make-A-Wish Greater Los Angeles. For more information and tickets, visit lakings.com/makeawish. As yet another ongoing example of the Kings’ consistent involvement with Make-A-Wish Greater Los Angeles, the team hosts a Star-of-the-Month program that treats local wish kids to Kings tickets, a pre-game meal, and the opportunity to take part in one-of-a-kind experiences like watching warm-ups from the penalty box or riding the Zamboni. During its 20-year history, the Kings Care Foundation has donated over $9 million in monetary and in-kind support to various organizations throughout the local Los Angeles community, including Make-A-Wish Greater Los Angeles. This award-winning LA Kings charity focuses its community outreach efforts on enhancing education, recreational and health-related program for children.